Be a Travel Writer - Travel Writing Course - Travel Writing Jobs! Ready to Enjoy the Luxurious Life of a Travel Writer? the Most Exotic Destinations, ABSOLUTELY FREE! unveils EVERYTHING you need to know! The life of a travel writer is pretty darn good. They get to enjoy FREE first-class travel. Free five-star hotel accommodation. Free meals at exotic restaurants. Free tickets to the best shows. Free limousine pickups. They also get paid BIG MONEY to write about experiences. Even though some “armchair travel writers” don’t even travel to the places they’re writing about! Because I’m a travel writer myself! And today, I’d like to share my secrets – with YOU. Whether you want to become a published writer, or you’d like to enjoy a little more five-star luxury, or you just want to earn extra money from the comfort of your own home – I can make it happen for you. Read on – and learn more! Uncovering the Myths of the "Fire Fox" in Lapland! I’ve had my writing published the world over: fiction, non-fiction, children’s stories, a novel, and courses such as The Ultimate Copywriter. I’ve written for all the leading publications - from The Stage to daily papers like The Guardian and The Independent. However, of all of my writing, there’s one type that clearly stands out from the crowd. Because it gives me access to fresh worlds I’ve never even dreamt of before. Like the time I was paid to go snorkelling just off a little-known island near Tahiti, with stunning underwater views that easily outshine the Great Barrier Reef. Or the time I spent fifteen minutes alone inside the only air-conditioned room in Cairo Museum, staring straight into the eyes of the famous mask of Tutankhamen. These are the experiences that will stay with me for the rest of my life. And THAT is why I love travel writing so much. Tempting People Like YOU to Write Good Reviews! Have you ever spoken to a REAL travel writer? Well, I’m one of those “real” travel writers. And I can tell you that it’s EASY to begin enjoying some of the fantastic 5-star benefits you may have heard rumours about – JUST by writing a few simple words. Last year, for example, I was flown business-class to New York City. I stayed in a chic suite at the Royalton Hotel for three nights. I dined with friends at Le Bernardin and Masa, two of the best restaurants in the whole of NY. I was given a press pass to a number of exhibitions, including free entry to every major tourist attraction. It was all courtesy of the official New York City tourism board. All I had to pay for was a taxi from the airport to my hotel. Which cost around $30. I later wrote four separate articles about my experiences during that trip, and earned myself a total of £700 (around $1400) for four days of luxury. With five-star treatment like this on the table, you’d expect the travel writing industry to be overflowing with writers... right? Magazine editors are practically CRYING OUT for fresh writing talent. Heck, my editor at the Global Writing Network was looking to take on new travel writers – just today. And during my visit to New York City, the tourism board were practically BEGGING ME to provide them with fresh contacts in the industry. They alone have an annual marketing budget of OVER $60 million to spend on getting writers like you to write about the city in a favourable light. And that’s just ONE of the thousands of tourist boards out there, DESPERATE to give you the best possible experience of their region – all in the hope of bringing in a few extra tourism dollars. Both editors AND tourism boards want YOU. Can you just IMAGINE all of the exciting experiences you could be enjoying RIGHT NOW – just by throwing together a few words? Want 5-Star Luxury WITHOUT Travelling the World? - Without Ever Having to Leave Your Armchair! But what if you’re not much of a traveller? You can still become a published travel writer AND enjoy lucrative cash payments for your work – without even leaving your armchair! Just write about your experience. Where did you last go on vacation? What adventures did you enjoy on your last weekend away? Where are the best restaurants in Paris… Texas… Manchester? All of this information can QUICKLY and EASILY be compiled into a fascinating, informative travel article – in LESS than an HOUR. And you can be paid an average of $400 / £200 just for putting your opinions into words. I’ve done it time and time and time again. Can you see just how PROFITABLE and enjoyable travel writing can be? And even if you aren’t a regular traveller, when you do eventually go on your annual vacation – you can be sure of great service and five-star luxury. So, whether you’re a traveller or not, travel writing itself is a GREAT way to earn money – and get published – quickly and easily! Here's How YOU Can Get Started As A Travel Writer! - And How to Become the Editor's New Best Friend! Interested in getting started as a travel writer? It’s a fantastic way to enjoy life – whether as a part-time hobby, or as a full-time writer. But it’s also fraught with pitfalls, too. And if you aren’t AWARE of them, it’s easy for things to go VERY WRONG. When I started in the industry, I was personal friends with one the best travel editors in the United Kingdom. There was little this guy didn’t know. He took me under his wing and showed me the tricks of the trade. That was 20 years ago. Now, I’m leading the field myself. And I learned: Travel writing can be DANGEROUS. Editors want their articles to follow a particular style. There are certain techniques you MUST stick to, unless you enjoy immediate rejection. And there are key pieces of information that must be delivered with each article – some of which is simply for the editor’s reference, and will never be published. That’s the sort of information you can’t glean simply by reading existing travel articles. Oh, and what about photos, too? They’ll literally TREBLE the amount of money you’re paid for an article. But you need to take photos in a very specific way. If you don’t, an editor will either use stock photos – or simply reject your article. Editors are DESPERATE for content – but LOW on time. You need to hit the ground running. If you DON’T get it right first time round, you might as well rip up your imaginary boarding pass – and wave goodbye to five-star luxury. Once you’ve been rejected from one travel magazine, it’s unlikely an editor will even consider future submissions. YES – Travel writing is easy. But YES – It’s a CLOSED INDUSTRY to the outside world. That’s why you need someone “in the know” to get you started. And I want to be that person, with my new course: Travel Writing Secrets. Are YOU Ready to Discover Travel Writing Secrets? PLUS, Get Published and Get Paid, Too! So, are YOU ready to discover the wonderful world of travel writing? Ready to begin enjoying FREE first-class travel, FREE luxury hotels, FREE five-star restaurants, FREE VIP passes to big-name attractions? And are you ready to get paid GREAT money for writing about your experiences – even if you never leave the comfort of your home office? If so, then you will absolutely LOVE my new course – Travel Writing Secrets. I’ve spent the past three months arduously piecing together my knowledge from YEARS in the industry. I’ve collected all of my secrets – and brought together absolutely EVERYTHING you need to get started in this glorious industry. From the little-known tricks for securing your first travel writing article, to exactly what to include in your regular submission. From the most revealing interview techniques, to “ready to run” sample travel writing templates. From the contacts you need to know, to the websites you absolutely MUST bookmark. My new course covers it all. It’ll show you EXACTLY how you can make BIG MONEY and enjoy AWESOME LUXURY TRAVEL – all just by becoming an official travel writer – within minutes. I’ll give you EVERYTHING you need to get started. 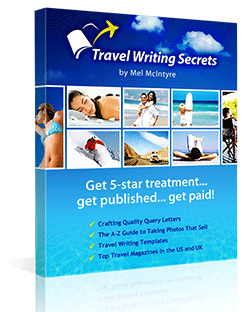 Take a SNEAK PEEK Inside Travel Writing Secrets! Uncover Inside This Brand New Course! Want to take a sneak peek inside my new Travel Writing Secrets course? How to BREAK INTO the world of travel writing – and land your FIRST, all-important assignment! The SECRETS to dealing with agencies to enjoy HIDDEN perks – from five-star hotels to first class flights! The SEVEN SKILLS you absolutely MUST develop before you get started in the travel writing trade! How to WRITE about your travelling EXPERIENCES and earn hard cash – without leaving the house! The THREE THINGS every travel article must do. Miss one of these, and you might as well send your article straight to the Recycle Bin! The SEVEN TYPES OF ARTICLES that every editor is looking for. Make it clear to them which type you are submitting! The T.R.A.V.E.L. article writing model. Follow this step-by-step and you’ll NEVER write a bad travel article again! How to OUTLINE your article first – using my seven-step no-fail system! The three-step P.D.A. method for researching your trip, before you leave. The smart V.I.S.A. system for adding STYLE and FLAIR to your article. Even if you’re not sure you have any! The SEVEN METHODS for quickly writing perfect lead sentences. Get the reader HOOKED – with these starter phrases! The SIX WAYS to spice up any travel article – and give it the W.H.O.W. factor! EXACTLY what to do, and at what times – including four things to do before you travel, five things to do at the destination, six questions to ask during your trip, and four things to do after! A FULL and COMPREHENSIVE analysis of a well-sold travel article! Discover EXACTLY what works and what doesn’t. The PUSH technique for creating perfect article titles, each and every time! What a “FISHPOT” is – and why it’s critical to your success! The NINE SECRET WEBSITES that provide you with ALL the latest contact information for major newspapers in the US and UK! The THREE MAIN MARKETS that continuously buy up travel articles! Three strong tips on how to PITCH your story to get the editor’s MAXIMUM ATTENTION! Seven other LITTLE-KNOWN MARKETS that are desperate for travel articles – right now! How to deal with TRAVEL EDITORS – and the three tricks that GUARANTEE you repeat business! There’s absolutely NOTHING this course misses out. I’ll show you EXACTLY how to join the league of professional travel writers, like myself – earning BIG MONEY and enjoying BIG LUXURY! PLUS: Grab These HUGE Bonuses, Free of Charge! AND Discover My Black Book of Industry Contacts! So, are you ready to get published – and enjoy the lifestyle of a travel writer? You see, travel writing isn’t just about throwing together a few words and hoping they sell. You sometimes need to take photos. And write query letters. And make contacts within the best magazines. But don’t worry about a thing. I’ve done all of that for you. Included alongside this brand new course, I’ve created four HUGE bonuses covering everything from my little black book of contacts through to travel writing templates. Your query letter is like a sales pitch to the editor. If you get it right, you’ll have sold your article before it’s even read! And a bad query letter will land you straight on the rejection pile. That’s why it’s CRITICAL to get your query letter right. I’ll show you PRECISELY how to do just that – and I’ll even give you quality samples to work from. Read, copy, and get ready for success! Did you know that photos will TREBLE the amount editors pay for your article? But you MUST follow our style guidelines, or the editor might as well just use a boring stock photo. It’s EASY to take photos for your articles and ANYONE can do it with just a regular digital camera. My 30-page bonus guide shows you EVERYTHING you need to know! Struggling to piece together the perfect travel article? The Travel Writing Templates bonus literally does it for you! Just answer the questions in this 30-page bonus guide – and you’ll have EVERYTHING you need to write a gripping travel article. Don’t wait for the muse. Grab it by the gonads – and start non-stop writing, with this brilliant addition to the course. Looking for the best contacts in the industry? This bonus guide is my twenty-page BLACK BOOK of personal contacts in the industry. You’ll find out which magazines pay the best, what they specialize in, where to find their submission guidelines, and how to get in touch with the editor. Critical! 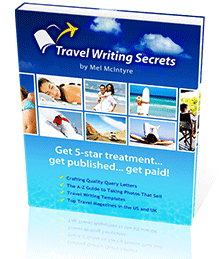 When you decide to order Travel Writing Secrets TODAY, I’ll automatically throw in ALL of the above bonuses – ABSOLUTELY FREE of CHARGE! It’s NEVER been easier to get started in the world of travel writing. I’ll give you EVERYTHING you need. In Exactly 30 Days, YOU Could Be a Travel Writer! This NEW Course Provides EVERYTHING You Need! PLUS: Buy In April For Our Special Offer Price! In just one month from now, you could become an official, published travel writer. Enjoying a fantastic income from selling your words. Revelling in five-star luxury and first-class travel. Thrilled at reading your first travel article in a national paper. All YOU need to do is make the decision to read the Travel Writing Secrets course – and enjoy AMAZING success. So, how much does this course cost? You can buy the ENTIRE course today, online for just $147– JUST $97! April MARKETING OFFER: Buy the ENTIRE COURSE TODAY, with ALL FOUR BONUSES – for JUST $47! NO HIDDEN CHARGES. $47 IS ALL YOU PAY. There’s NEVER been a better time to discover the entire Travel Writing Secrets course. You get EVERYTHING you need to get started – all for less than the cost of one night’s stay in a flea-ridden motel. And just think of the five-star luxury you’ll be enjoying as a result! So, get started TODAY. Click on the button BELOW and grab your copy – NOW! Discover the ENTIRE COURSE Absolutely Risk-Free! I Guarantee You'll Get Published & Earn At Least $1000 - Or I'll Refund Every Single Penny You Paid! Not sure whether you want to risk discovering this course? I absolutely GUARANTEE that within just SIX SHORT MONTHS, you’ll have published AT LEAST three travel articles in nationwide papers – and earned a minimum of $1000 / £500 from your work. In addition, I PROMISE that after getting your name out to the contacts I provide, you’ll be absolutely INUNDATED with offers of work and luxury travel – and will start having to TURN DOWN 5-star freebies from the big tourism agencies. It’s EASY. I guarantee it. And if you’re not 100% thrilled with the results? Try it out for six short months. If you’re not amazed with the results, just return it within a year and we’ll refund every penny you paid (minus original S&H). So, are you ready to take the advice of a REAL travel writer – and begin enjoying the advantages of being a published travel writer yourself? Travel writing is a true hidden gem. Travel to the most exotic locations for free. Stay at the world’s finest hotels. Enjoy the best food available. And on your flight on the way home, knock out a couple of articles – and get paid big money to wit about your experiences. Travel writing is definitely THE most exciting writing job around. Order my FULL 150-page no-holds-barred course TODAY – and you’ll also receive all FOUR bonuses, 24/7 online support AND my 100% risk-free money-back GUARANTEE. There’s never been a better time to order – and to discover these amazing travel writing secrets. So, click the order button below NOW, and prepared to amaze yourself! PS. You can ONLY buy Travel Writing Secrets at THIS site! Don’t be fooled by cheap imitations. This course is NOT available on eBay, in stores, or elsewhere online. It’s only available EXCLUSIVELY at travel-writing-secrets.com. Grab your copy NOW – by clicking HERE! PPS. Can you IMAGINE where your next vacation might be? In a thatch-roofed building on stilts in the Pacific’s Bora Bora lagoon. Staring deep into the Arizona-like Apostile Hills in Camps Bay, South Africa. A four-night Elvis-themed cruise through the Caribbean. Venturing down the Gold Cave in Qinhuangdao, China, taking snapshots of the stalagmites and stalactites. The world is waiting for you. Click HERE to order the course! PPPS. Don’t forget – Our support team are here to assist 24/7! You won’t stop hearing from us just because you’ve purchased the course. You’ll also begin receiving our newsletter – and have 24/7 access to both myself and my team. Whatever you need assistance with, we’re here to help. Click HERE to buy your copy TODAY! Note: Earnings cannot be guaranteed. Results may not be typical.